Beautiful luxurious 2 Bedroom Villa overlooking the ocean.Amenity cards for The Seabrook Island Club are included. Property Size 972 sq. ft. Sit on your balcony and watch the ocean. This is an Island get-a-way. 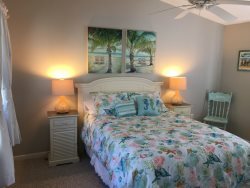 This beautiful 2 bedroom 2 bath villa located with a magnificent view of the Atlantic Ocean was remodeled from the studs out with all the high end modern amenities you would expect ,including flat screen TVs all granite counter tops and luxurious baths. This Villa is allergy sensitive with a no-pet, no-smoking policy. The location is on the the most pristine 3.5 mile beach you may ever see. You also have access through the owners membership to The Seabrook Island Club and all that entails. We have a new Beach club with 2 magnificent ocean front pools, a great dining facility right on the beach and a bar with the same view. Additionally 2 great golf courses are available for your play , one of which is the original Robert Trent Jones Senior design, the other a Willard Byrd gem. Both of these play out of a newly built clubhouse that is less than 50 yards from this villa. A new tennis facility with multiple clay courts located near the owners gate is also yours to enjoy. If horseback riding is an activity you might enjoy, we are one of a very few facilities that can offer that amenity including beach rides. If time and energy permit, we also have available a state of the art fitness center that requires a small fee to use. Our Island is a short 30-minute drive from charming historic Charleston, S.C., with all the magic that implies, great dining, a lively arts scene and great nightlife in a wonderful small city. Come join us in our little piece of paradise! Play hard all day or do nothing and be pampered. The choice is yours. Keywords: This ocean front, five star, 2 bedroom, 2 bath Atrium Villa has all the comforts of home. This top floor, vaulted ceiling villa has just been renovated from the studs out with hardwood floors, stainless steel appliances, granite counter tops and new everything! Come see for yourself. Bicycles:Can be rented for reasonable prices.